Today’s Premium download is a set of unique text effects in Photoshop. Maybe, you might have seen several Photoshop text effects, but this set is unique in its style, and is very close to what the nature of the text represents the effect. So, download the PSD file and check out the various layer styles applied for each text to bring out the resultant effect. 1) Milk Mommy is a smooth effect representing “milk”. 2) Golden Gunn is a combination of effective layer styles with golden yellow. It represents fine bevels and embosses referring to a slick “gun”. 3) Dual Blubber is a two colored rubber text effect. You can see the dual colors in the text with shiny surface. 4) Gothik Dracule is a text effect created using inner bevel and contour to represent the modern idea of “Gothic Dracula” type. 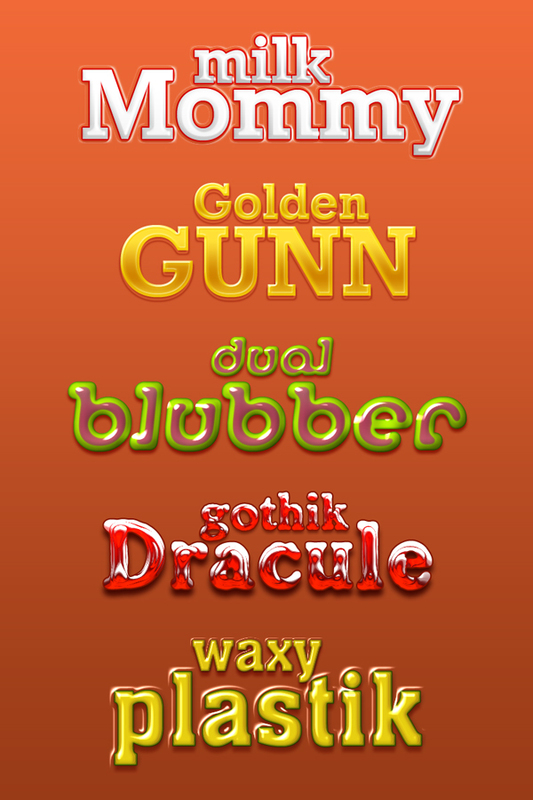 5) Waxy Plastik represents the “shiny plastic” text effect. To use these text effects, all you need to do is to copy the layer style by right-clicking on a text layer and click “Copy Layer Style” and then apply the effect on your own text by right-clicking on your text layer and click “Paste Layer Style”. Increase or reduce your font size until you get the correct result of the effect, or you can adjust the layer styles to see the desired result. NOTE: Please read their terms on font usage on the respective websites. Geometric Slab is a paid font.